Aghadoe Heights, Co. Kerry Photo by Cassandra Hannahs, 2014. Reproduced here with permission. 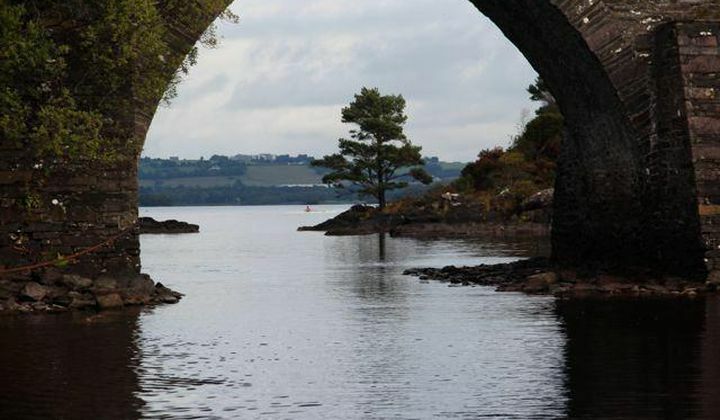 Yesterday, we crossed under Bricín Bridge as our boats left Lough Leane in Killarney National Park. Its name means “Bridge of the Little Trout,” and it made a lovely frame for Ollie’s photo, as old bridges often do. 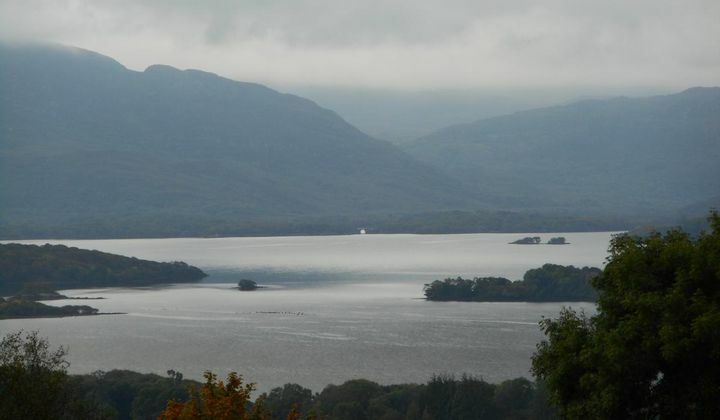 Today, our first stop on the Ring of Kerry is at Aghadoe Heights, looking back towards where we were yesterday. From this distance, set within a broad, beautiful canvas, the “Bridge of the Little Trout” has become a tiny semicircle across the lakes. Everyone sees it before me. Gerry points and says, “It looks like a pin prick there.” I finally realize it’s right in the center. This sense of perspectives changing and opening up stays with me all day. We pause to absorb glorious vistas: over the Valentia River, out across Ballinskelligs Bay, at the top of Coomakista Pass, and of course at Ladies’ View, its name reflecting the admiration of Queen Victoria’s ladies-in-waiting during one of her rare visits to Ireland. These views were carved by glaciers, reinforcing the vastness of the timescale here. We discuss smaller bits of evidence that prove this too: such as tiny fossilized footprints on Valentia Island left by a salamander creature over 350 million years ago, and DNA sequences of Killarney shad, a rare type of fish that was isolated and landlocked when the ice sheets made their final retreat after the Younger Dryas. Eightercua Alignment, Co. Kerry, Photo by Sandra Dovberg, 2014. Reproduced here with permission. But we veer suddenly from scientific evidence to mythology as we pass the four stone alignment of Eightercua just outside Waterville. 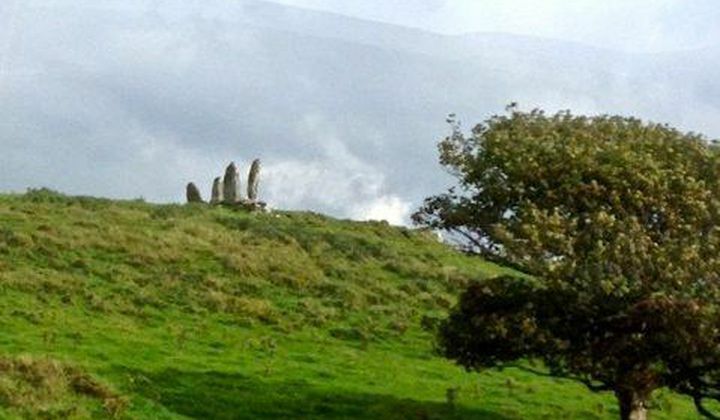 In Irish legends, these standing stones mark the burial place of Scéne, wife of the warrior bard Amergin, who led the first people to Ireland and claimed the island through a rosc, or poem of power. The words of this poem were written down in the eleventh-century Lebor Gabála Érenn (The Book of the Taking of Ireland). And in fact, we heard the “Song of Amergin” a couple days ago, outside Galway. This silent place now recalls that music, as we watch the stones against sky point west toward the setting sun of winter solstice, as they have for over three thousand years. 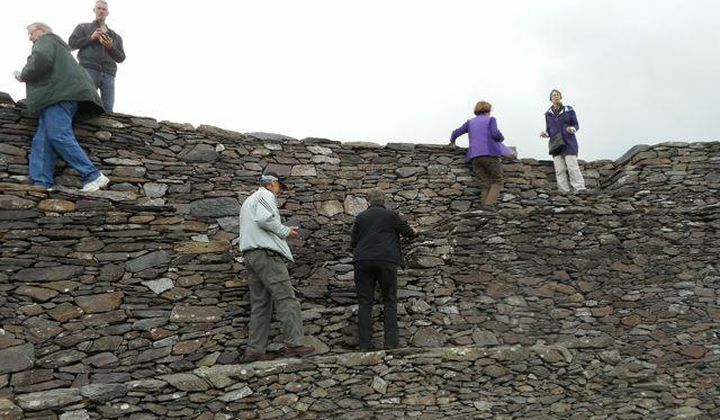 Cahergall Stone Fort, Co. Kerry Photo by Cassandra Hannahs, 2014. Reproduced here with permission. The grandeur of the views and the vastness of the timescales underline the broad sweep of history on the Ring of Kerry. We enjoy a stop at an Iron Age stone fort called Cahergall (meaning “Bright Stone Fort”), climbing its terraced inner walls like school kids to enjoy the views it still commands of the countryside. Someone of stature lived here a thousand years ago, and we talk again about the Iron Age tools, weapons and artifacts that we saw earlier at the National Museum in Dublin to try to reconstruct their material culture. 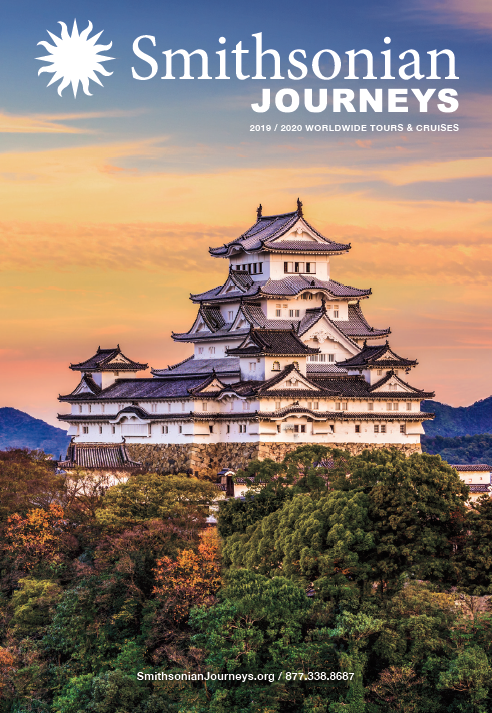 Standing at the top, we can certainly imagine a battle trumpet sounding from these walls.